Perfect white-colored clothes are the dream of every housewife. But unfortunately, as time passes, the white clothes turn grayish color, or even a bit yellow. In these situations, how to restore the freshness of the clothes and make the white laundry white again? Definitely don’t try synthetic bleach, for it will make the situation of your clothes even worse than it already is. You will not have to buy expensive laundry products or bleachers anymore. Here is Most Effective Way To Get The White Clothes White Again. Sometimes an old combination can do the trick. Potassium Permanganate? It is a ‘must’ when it comes to laundry whitening, and you will be pretty pleased with the results. Dissolve a few potassium permanganate crystals into 10 liters of water, adding more until your water turns a dark-purple shade. Afterwards add 200g of your detergent to the water and wait for it to dissolve. Don’t worry about the color of the solution; it will not dye your clothes purple. Put your linens or clothes into the solution and then seal your tub or sink with nylon. Leave your clothes for 5 hours or the whole night, and then wash them in your washing machine. Repeat the procedure if you feel that is necessary until you are satisfied with the outcome. Alternatively, you could switch the steps and wash your clothes first. If you do it this way, make sure that you rinse your clothes after soaking them in your potassium solution. You can also use baking soda to restore the white in your clothes. Baking soda is an even cheaper and easier to find alternative to potassium permanganate. 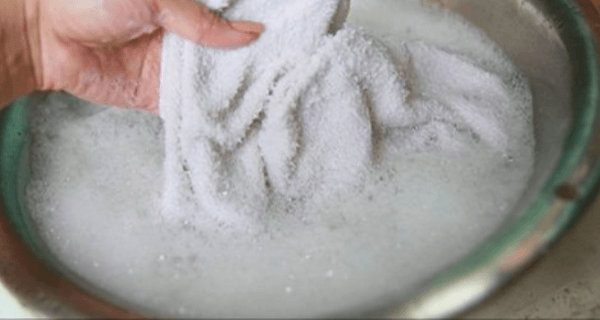 Mix 2-3 tablespoons of baking soda with your detergent and pour the resulting powder into the detergent compartment in your washing machine, and then wash your clothes as you always do. Adding baking soda will boost the whitening power of your detergent and it will restore them to their original color. If you are skeptical, give it a try and see how easy it is to get your clothes and linens white again. If you like the results, share with your friends and help them whiten their clothes easy! We hope that these tips are of great value to you. Try them now and enjoy your white clothes all over again.